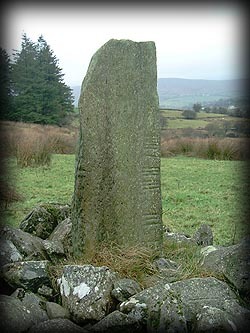 The stone fell at some point in it's history and has been re-erected. 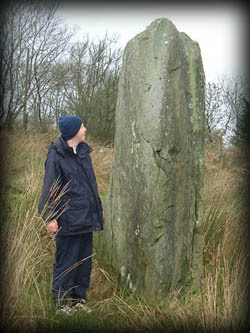 About a hundred metres west of the Ogham stone is a large standing stone (pictured below) approx- imetely 2.25 metres high. If you look North across the valley you can see Dun Ruadh from here. Situated: If you are in this area I suggest you visit Dun Ruadh first. From there drive west and take the first left then take the next left about 1 kilometre along this road you will see a green gate opposite a large house, the two stones are in the field through this gate and clearly visible from the road. Discovery Map 13: H 617 838. Last visit January 2004.